ATLANTA – Get ready for a brand-new barnyard tale like you’ve never “herd” before! Featuring Farmer Brown and his clever, comical cows, Click, Clack, Moo: Cows That Type grazes the Center for Puppetry Arts stage with its debut June 9-July 26. Directed by the Center’s artistic director Jon Ludwig, this bovine bunch illustrates what happens when cows learn to type and chickens go on strike! Supported in part by the National Endowment for the Arts, Click, Clack, Moo: Cows That Type is adapted from the award-winning children’s book for the puppet stage by Ludwig and resident puppet builder Jason Hines. This fun farm tale features rod marionettes and rod puppets performed by veteran puppeteers Brian Harrison, Mandy Mitchell, Amy Sweeney, and Tim Sweeney, with narration and original musical accompaniment by Dolph Amick. All of the puppets, props and scenery were created onsite by the Center’s talented artists. To research and develop this production, the Center partnered with Georgia State University’s Early Childhood Education department and Georgia Organics, a nonprofit that promotes sustainable foods and local farms in the state. GSU paired the Center with several preschools and elementary schools where Ludwig and the Center’s education director Aretta Baumgartner presented in-classroom activities. Through sing-alongs, discussions, drawing and other educational exercises, more than 200 preK-3rd grade students influenced script development as well as puppet, scenic and costume designs. Each student was awarded a free ticket to the show in appreciation for their significant impact on the production. Georgia Organics advised Ludwig on elements of the script that involved farming; the show’s artistic team also toured nearby organic farms for design inspiration. Recommended for ages 4 and up, Click, Clack, Moo: Cows That Type is presented in the Mainstage Theater June 9– July 26. Visitors can enjoy discount preview days on Tuesday, June 9 and Wednesday, June 10. · Tuesday- Friday: 10 a.m. and 12 p.m.
· Saturday: 11 a.m., 1 p.m. and 3 p.m.
*The Center will be closed Saturday, July 4 in observance of Independence Day. Let's face it: most kids don't know what a typewriter is! 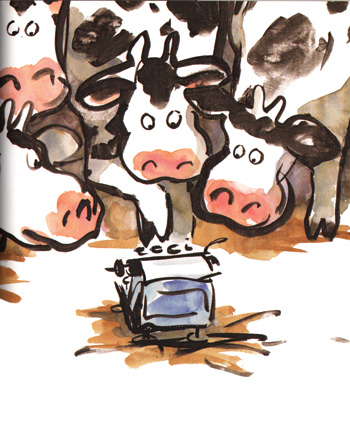 When you visit the Center during the run of Click, Clack, Moo: Cows That Type, children will be able to see, touch and type on a real typewriter—just like the cows do in the show! Free with admission to the Center. Operated by the Agricultural Commodity Commission for Milk and Georgia Dairy Farmers, the Mobile Dairy Classroom features a fully operational milking parlor with a live cow used for milking and feeding demonstrations! The program provides children with a better understanding of where milk comes from, how it is processed, the healthy benefits of consuming dairy products and dairy farmers' management of natural resources.` For more information, visit www.milkcow.org. Free with admission to the Center. Tickets for the show include entrance to the Create-A-Puppet Workshop (or To-Go Kit), where children can make their own Click, Clack, Cow Hand Puppet to take back to their own “barn!” Due to construction for the Center’s ongoing expansion and renovation project, all Museum exhibits are closed at this time. The new museum will open this fall.